Barbados has a large number of festival and events running throughout the year. If you’re lucky enough to be in the country when they’re running, it’s definitely worth heading down and seeing them for yourself. Everyone smiles in Barbados. We were lucky to be there for the Holetown Festival, marking the arrival in 1627 of 80 English settlers and 10 African slaves – the start of the colony. Top of the bill was the best calypso singer in the Caribbean – his name: Red Plastic Bag. Travel on the yellow reggae buses, watch and swim with turtles and enjoy amazing sunsets. The largest event on the island is the Crop Over festival. As in many other Caribbean and Latin American countries, Crop Over is an important event and celebrates the days when sugar cane was king. At the end of the sugar season, there was always a huge celebration to mark the culmination of another successful sugar cane harvest – hence Crop Over. The festival includes musical competitions and other traditional activities, and features the island's calypso music. The festival gets under way at the beginning of July and ends with the costumed parade on Kadooment Day, held on the first Monday of August. In early November, the Food & Wine & Rum Festivals bring together many of the best Bajan chefs to showcase their culinary abilities and create some delicious food. Later on in November you can see the Independence Day celebrations featuring fireworks, light displays and an arts festival showcasing musical and theatrical talent from across Barbados. In January you can pay a visit to the Horticultural Annual Show, which is a fantastic opportunity to see some of the country’s most exotic flowers and plants in one place. You can also hear live music by the Royal Barbados Police Band. On throughout March to July is Holders Seasons, which is a fantastic boutique festival featuring theatre, comedy, jazz, blues, and classical music. This is considered one of the most unique and exciting festivals of its kind. From July through August, Bridgetown hosts the Crop Over Festival, celebrated at the end of the Sugar Cane season. It is a grand celebration featuring calypso dancing through the streets, a colourful parade and local delicacies. Bridgetown is Barbados’ primary shopping area – Broad Street is known as the hotspot with plenty of shops and boutiques. One of the major highlights of shopping in Barbados, though, are the tax-free centres offering fantastic deals. To shop here you just need to bring your passport or airline ticket. Very close to One Battaleys Mews and around 10 minutes by car is Limegrove, the new shopping experience in Holetown. In addition to shops and boutiques, Limegrove offers restaurants, luxury theatres, exclusive fine art and an extensive range of activities and nightlife experiences. If you consider yourself a discerning cinema goer, head to the Limegrove Cinemas for leading movie titles delivered in excellent Dolby 3D and digital sound; or visit one of the luxury theatres, where you can order food with the touch of a call button without having to leave your seat. If you are visiting with the whole family, make sure you experience Play creation, an indoor and outdoor play centre that provides new, innovative and exciting activities for your children to enjoy. Sport is a big part of life in Barbados so, whether you’re a spectator or a participant, there will be something for you to enjoy. You will find a fantastic array of water sports on offer, excellent locations for scuba diving, catamaran sailing and windsurfing, while the rockier parts of the island lend themselves perfectly to paragliding. As with many of its Caribbean neighbours, Barbados is relatively cricket-obsessed. There will almost certainly be opportunities to watch a game – chill out with a rum cocktail or a Banks beer and enjoy the spectacle. 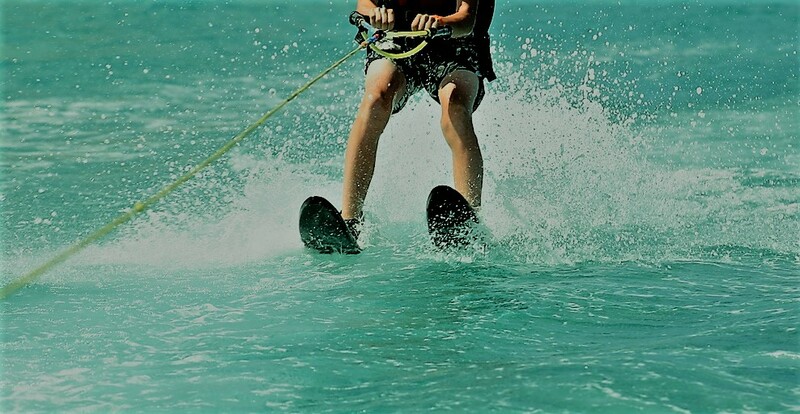 Wave runners (or Jet Skis as they are sometimes called) have become one of the most popular sports throughout the world, and what could be better to explore the beautiful crystal clear coastal waters of Barbados. Waverunner are available for hire from most bays, beaches and coves around Barbados. The Yamaha XL700 – currently the most popular personal watercraft in the island – seats up to three people, has a 701cc engine and is fun and easy to operate and with the large hull design makes it stable and will rarely turn over unless driven recklessly. Barbados is increasingly being regarded as one of the top islands for a Caribbean golf vacation. Several hotels and resorts now provide special golf packages. With an abundance of clubs and breath-taking courses to challenge even the most experienced golfers, you can tee-off at a huge number of excellent courses including Sandy Lane and Westmoreland, amongst others. Fodor's travel guide says of Barbados, “Golfers can choose from among some of the best championship courses in the Caribbean". And it's indeed true. The excellent weather conditions make Barbados an ideal location for golf and the perfect vacation spot for golfers and "would-be" golfers, with most local clubs offering professional instruction. Several golf tournaments are hosted throughout the year, attracting participants from many countries, including Europe and North America. In December 2006 island hosted the World Golf Championships World Cup. The four-day tournament was held at the Sandy Lane Country Club course on the west coast of the isle. In October 2004, Tiger Woods – perhaps the world's most famous golfer – chose Barbados as the venue for his wedding. The ceremony took place at the Sandy Lane Golf Course. Barbados is most probably not the first destination coming into someone's mind when planning a holiday associated with bicycle riding. And it is not widely known that race bicycling as well as mountain biking is very popular amongst locals on the Caribbean island of Barbados. But Barbados has quite a history of successful competitors as well as a number of excellent bike routes and tracks. When the weather turns miserable in northern hemispheres, the beautiful climate of Barbados – never too hot and never too cold, with year around temperatures of 28/29 degrees Celsius – is an excellent reason to choose Barbados as a cycling destination. Whether you are cycling high above the east coast with the Atlantic Ocean in sight, climbing up the steep hill to St. John's Church , or riding down the roads of Bathsheba framed by tropical vegetation, or cruising along the East Coast Road, or climbing the "almost mountains" up to Cherry Tree Hill or Apes Hill, there is always something to catch the eye. Hike Barbados takes you through cane fields, gullies, tropical forests and coastal communities to explore the unique geological and social structure of the island. Along the way you will meet new friends, enjoy healthy exercise and observe the delicate balance of the unique heritage and environment of Barbados. This hikes are free, but donations towards the work of the Barbados National Trust. The most popular dives off Barbados are on the sheltered west and south coasts of the island, which are alive with shallow fringing and banking reefs. Unlike many of the islands in the Caribbean which are of volcanic origin, Barbados was formed primarily from coral. Diving conditions, including visibility, are good year-round. The average water temperature is mid 80 in summer (mid-Apr to Nov) and high 70 in winter (Dec to mid-April). Barbados is an excellent destination for divers of all levels - beginners learning to dive, those looking to get some scuba experience, and seasoned divers. Most dive shops in Barbados offer a full range of PADI-certified courses for any skill level. And even the most experienced divers will benefit from teaming up with a local dive shop to locate the best sites & get insider tips! Highlights: coral reefs, eels, rays, turtles and barracudas. There is a hyperbaric chamber in Barbados. Explore Barbados' oldest natural artifact - the coral reef! The family friendly, Atlantis Submarine adventure is one of the most unique and highly recommended attractions in Barbados. Imagine yourself in a real submarine, with view ports all around, fully submerged in the aquamarine Caribbean Sea, as curious fish peek in and sea fans sway. The award winning Atlantis submarine tour is one of the most highly recommended attractions in Barbados for adults and children (Min height 3 feet.). Imagine yourself in a real submarine, with big view ports all around, fully submerged in the aquamarine Caribbean Sea, as curious exotic fish peek in at you and sea fans sway. The tour lasts ninety minutes from departure in the office to return and you will spend forty to forty-five minutes (40 - 45 mins.) underwater. This fully narrated “must-do” undersea voyage, can take you to a shipwreck and to depths of 150 feet, in air conditioned comfort, which in the past has been reserved only for scuba divers. The submarine day dive features numerous fish and busy reef life and the very different night time experience is a more romantic focus on the corals, colour and night predators. Create amazing unforgettable memories as you are piloted by a professional crew among colorful coral formations, and tropical marine life, aboard the unique Atlantis Submarine.